SRG Global have developed in-house a complete engineered solution to temporary movement joints – SureLokTM. SureLokTM is the result of years of experience, investment, research, development and testing. It has been developed for the post-tensioning, construction and mining industries. SureLokTM is revolutionary as it offers a range or safety, cost, design and performance benefits. The SureLok™️ slab to wall range encompasses three SureLok™️ products. The SureLok™️ 160W, the SureLok™️ 160W+ and the SureLok™️ BRS (Basement Retention System). All three products are designed to provide a temporary movement joint between a wall and slab and eliminate the requirement for pour strips. be fixed inside the wall cavity and positioned and secured by local reinforcement or is set into a precast wall. The SureLok™️ 160W+ is used in applications where the anchor is attached to the inside of the shutter by way of the void former. 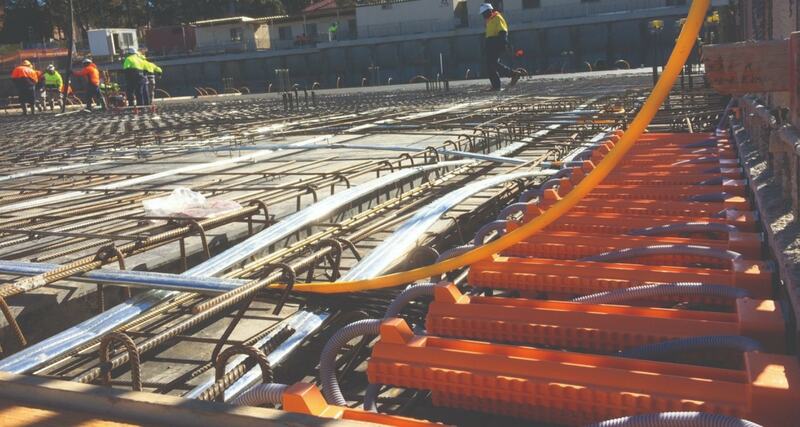 The SureLok™️ BRS is used for basement applications where the walls are formed using shotcrete.